In an emotional speech at Federal Parliament, former Treasurer Joe Hockey delivered his final remarks filled with past memories and his hopes for the future of his party. The dumped Treasure showed no signs of bitterness when he delivered his glassy eyed, choked up speech, uninterrupted except for the occasional coos of “here, here” in agreement from members of the House. “Most people leave this parliament as a result of defeat, death, disillusionment or disgrace; we all have to work harder to leave with dignity,” Mr Hockey said. Praise was quick to spill from the former Treasure’s lips for the past two LNP Governments under the leadership of John Howard and Tony Abbott. ” It was a great honour to serve as a minister in a number of Howard Government ministries and it was even a greater honour to serve as treasurer in the Abbott Government,” Mr Hockey said. In a separate delivery, Prime Minister Malcolm Turnbull was quick to add support for Mr Hockey’s character. “You’ve held high office for almost every moment you’ve sat in this chamber, and you’ve executed every office you’ve had, discharged every office you’ve had with great passion, with imagination, with great compassion,” Mr Turnbull said. “You’ve done Australia proud. You will, I’m sure, do great things for Australia in the future,” he said. Even though the ex-Treasurer was known for controversial statements, after nearly two-decades in Australian parliament, Mr Hockey defends his actions and exalts himself in doing the greater good. “When faced with a choice I would always prefer to do what was right than what was popular,” Mr Hockey said. During his final speech in the House of representatives, Mr Hockey did not refrain from rebuking the nation’s ‘revolving door’ of leadership and ministers. “Ultimately this chamber can be responsible for its own undoing,” Mr Hockey said. “We cannot make it normal to have four Prime Minister’s and four treasurers in just four years,” he said. Mr Hockey thanked his supporters for getting his foot in the door of politics but the greatest thanks was reserved for his wife and his family. Vowing that he ‘won’t miss another one’ of his children’s birthdays now that he is relieved of his duties as Federal Treasurer. “Our jobs have become much more challenging over the years with the advent of a need-it-now culture that’s been backed by the unending and often unreasonable demands of social media,” Mr Hockey said. Twitter was ablaze with good bye and good riddance for the resigned treasurer. Joe Hockey gone-the incompetence riddle is now solved. Now to the puzzle of why in the first place. My, you're tough. 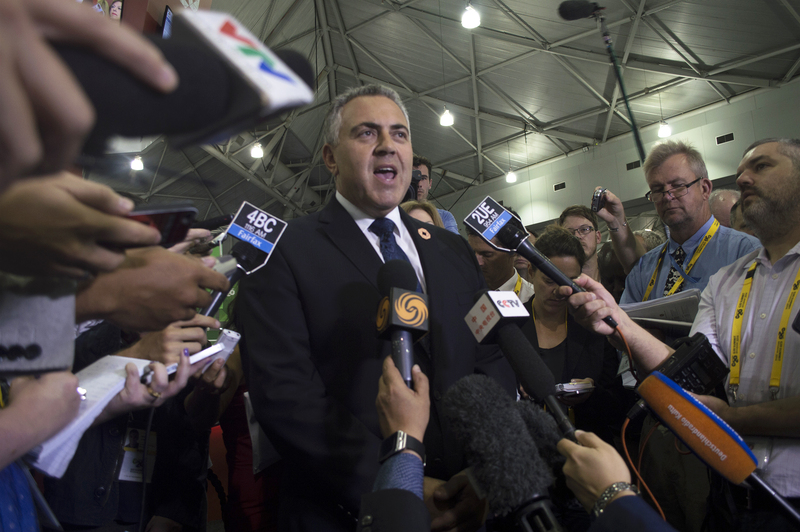 I didn't say I liked Joe Hockey's policies: they were appalling, a burden on the poor. But he was not a bad man. …and a last minute round of selfies, which ended up on social media. With departing words, Mr Hockey wished his party every success and gave them final advice.